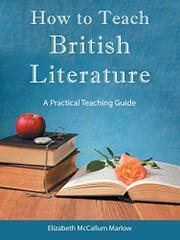 A manual for high school teachers offers a survey of British literature. Marlow (The Book Tree, 2008) draws on decades of experience as an English teacher to produce a guide for fellow educators who introduce high school students to British literature, particularly instructors whose pedagogy incorporates a Christian context. The book, which combines suggested readings, an overview of themes and techniques, and discussion questions, is arranged in chronological order, beginning with Beowulf and Chaucer and concluding with C.S. Lewis, George Orwell, and T.S. Eliot. Appendices include a glossary of literary terms, a sample curriculum, guidelines for literary analysis, and sample tests. Marlow addresses not only the content covered in class, but also her techniques for broadening students’ appreciation (“I read the last section of Beowulf accompanied by Dvorák’s Largo from his New World Symphony with classroom lights off”). The author does a creditable job of covering the basic elements of understanding frequently studied classics, and has produced a solid resource for teachers looking to develop a curriculum. The material is useful for instructors in nonreligious schools as well, though the language employed (“the secular professor Harold Bloom”; “the erroneous charge of homosexuality”) and the emphasis on the moral values expressed by works can be off-putting. Though the author criticizes bowdlerization, she has clear views on what volumes are appropriate for 16- to 18-year-olds (“I strongly suggest that teachers avoid The Miller’s Tale”; “One day, they may return to Brontë’s description of married love”). Marlow’s claims that students are “interested,” “impressed,” “amused,” “intrigued,” or “amazed” by elements of literary history may seem somewhat breathless, but her knowledge of and enthusiasm for her subject, as well as for the act of teaching itself, are evident throughout the book and contribute to its value in the classroom. A worthy, comprehensive guide for educators incorporating readings, study questions, and extensive literary analysis.